California is a state where President Donald Trump is unpopular and Democrats hold a 3.7 million voter registration edge. That combination could help propel Democrats to victory in battleground congressional districts and give the party control of the U.S. House. The most competitive contests are in seven districts held by Republicans that Democrat Hillary Clinton won in the 2016 presidential election, and an eighth district where the GOP incumbent is under indictment. — 10th District, including parts of San Joaquin and Stanislaus counties. Republican Rep. Jeff Denham won a narrow victory in 2016 in this farm-belt district, which Clinton carried by 3 points over Trump. Democrats hold a slight registration edge, but Denham, known for his involvement in water issues vital to agriculture, has proven tough to beat. Democrat Josh Harder has called Denham a pawn of national Republicans who has failed to deliver for his constituents. — 21st District, including parts of Fresno, Kern, Kings and Tulare counties. Republican Rep. David Valadao carried this district by a wide margin in 2016, even though registration numbers make it look like it should be a Democratic stronghold. Clinton won big here in 2016, and emboldened Democrats see the Trump agenda as a liability in the heavily Hispanic district. Democrat T.J. Cox calls his Republican rival a rubber stamp for the White House who poses as a moderate. But in a party known for hard-line immigration views, Valadao, the son of immigrants, supports a “responsible” pathway to citizenship for those who have entered the U.S. illegally, and he has pushed for a resolution to the legal status of 690,000 immigrants who came to the U.S. as children and stayed here illegally. — 25th District, including parts of Los Angeles and Ventura counties. Democrats have a registration edge in this swing district north of Los Angeles held by Republican Rep. Steve Knight, who faced a competitive race two years ago. Democrat Katie Hill, a first-time candidate, has raised over $2.4 million. Clinton won here by nearly 7 points. — 39th District, including parts of Orange, Los Angeles and San Bernardino counties. This open seat is held by retiring Republican Rep. Ed Royce, who heads the Foreign Affairs Committee. Registration is closely divided, and Democrat Gil Cisneros and Republican Young Kim, a former Royce aide, are in a tight race. Clinton carried the district by 9 points. — 45th District, entirely in Orange County. The seat is held by Republican Rep. Mimi Walters, who was re-elected two years ago by 17 points. Republicans hold a comfortable registration edge, but that margin has been shrinking, and Clinton carried the district by 5 points. Democrat Katie Porter, a law professor, supports universal health care and mandatory background checks on all gun sales. — 48th District, entirely in Orange County. Republican Rep. Dana Rohrabacher is seeking a 16th term and was easily re-elected two years ago. Democrats see an opportunity to oust a congressman whose name has come up in the investigation into Russian meddling in the 2016 election. He has denied any wrongdoing. Democrat Harley Rouda has been criticizing the congressman for his ties to Trump and support for Russia. — 49th District, including parts of San Diego and Orange counties. Nine-term Republican Rep. Darrell Issa is stepping aside after surviving his 2016 race by 1,600 votes. The coastal district has been growing more diverse and Democratic, although Republicans retain an edge in voter registration. Independents, who tend to vote more like Democrats, make up one-quarter of the voters. Democrat Mike Levin and Republican Diane Harkey are in a tight race. — 50th District, mainly in San Diego County with a small slice of Riverside County. 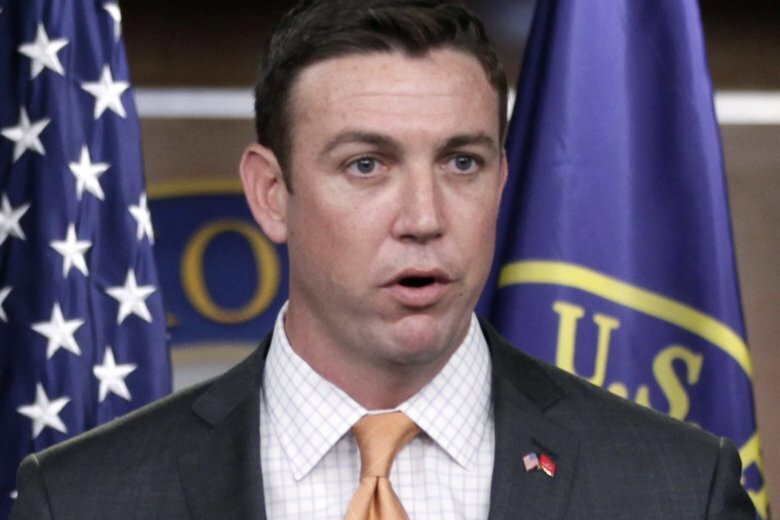 Rep. Duncan Hunter and his wife were charged by a federal grand jury in August with using more than $250,000 in campaign funds to finance family trips to Italy and Hawaii, golf outings, school tuition, theater tickets and fast-food purchases, then attempting to disguise the illegal spending in federal records. He’s depicted himself as a victim of a political witch hunt, but the charges have made the outcome in a once-safe Republican district less predictable and emboldened his Democrat opponent, Ammar Campa-Najjar, a 29-year-old first-time candidate.